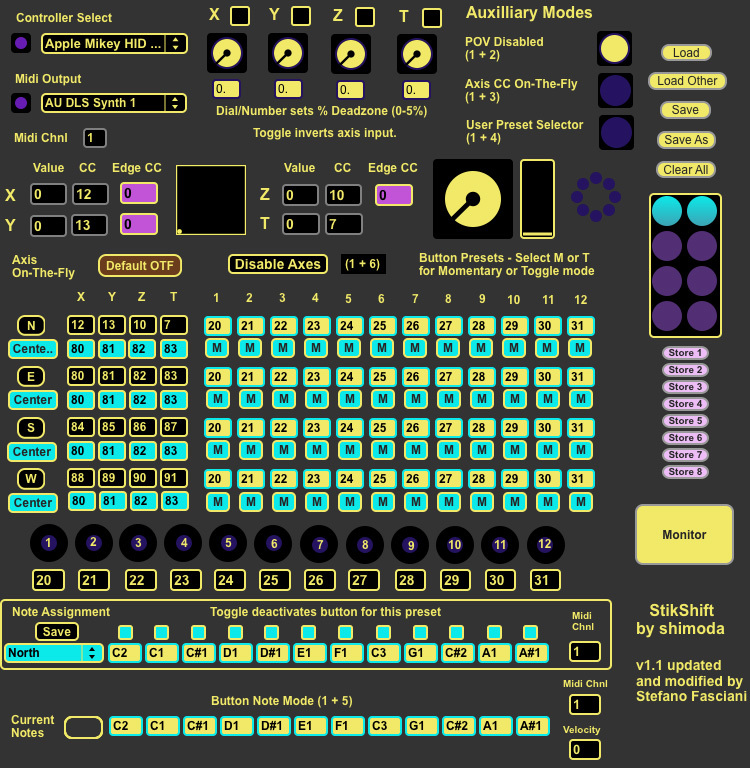 StickShift is a Max/MSP application developed by Shimoda (aka Mark Jarzewaik) which turns a Logitech Extreme 3D Pro joystick into an advanced MIDI interface for musical purposes or other generic control aims. 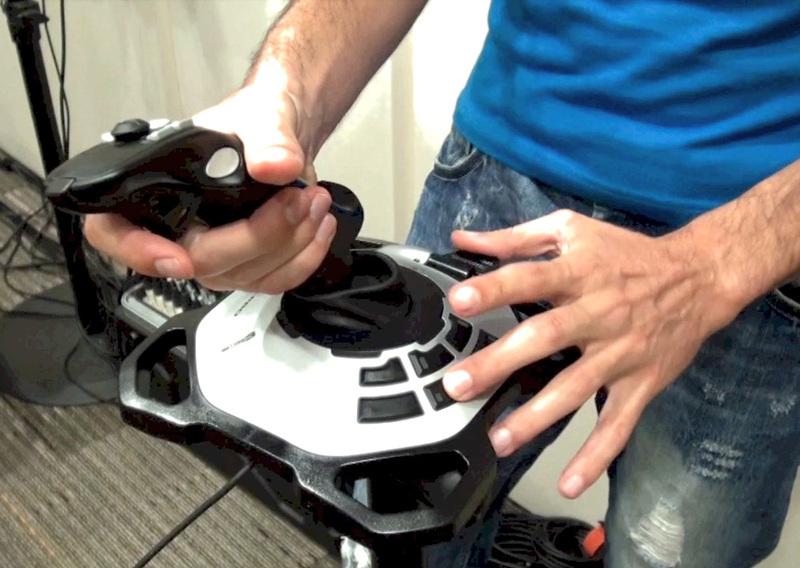 The joystick features 4 axes of continuous control (x,y,z, and throttle), twelve buttons, and a POV hat for a total of seventeen inputs. The 99% of the credit of this work goes to the Shimoda (original post in monome forum). My contribution is limited to the StickShift update to version 1.1, which presents changes necessary to run in Max6 under OSX, especially for the input range of the continuous controls, additional features for note playing such as the velocity, note off messages, midi flush, and minor bug fixing. The StickShift provides conversion of joystick movements and button presses to Midi Control Changes messages. In addition it features on-the-fly switching of groups of CC to user-defined preset values, plus optional note buttons playing via buttons. The Max/MSP patch is higly configurable and through the POV hat the user can quickly select across four different MIDI mappings, increasing fourfold the control capability of the joystick. In the video below there is an improvised performance using the Extreme 3D Pro with StickShift mapped to a drum rack, a synthesizer, and to a bunch of effects in Ableton Live. In the video I’ve used only a single fixed MIDI mapping. The StickShift allows to use the joystick as a standalone interface for musical performance, or as a side controller for occasional parameters variation and preset switching. StickShift is available for download from the link below (original manual included). To run the application open the StikShift_v1.1.maxpat, which requires the other sub patches in the same folder or elsewhere within the Max/MSP path. If you don’t have a Max/MSP license you can still run the StikShift using the free Max Runtime application bundled with the trial version. Tagged extreme 3d pro, improvisation, interface, joystick, logitech, Max/MSP, midi, performance, shimoda, stickshift.